The San Ramon Valley Dance Academy Presents "Impressions of the Nutcracker"
The San Ramon Valley Dance Academy proudly presents it's annual holiday production, "Impressions of the Nutcracker," at the Dougherty Valley Performing Arts Center. The beloved holiday story of the Nutcracker comes to life on the stage with stunning costumes, professional staging and talented dancers from our own San Ramon Valley area. Come see the stars of tomorrow as they share their talent and love for dance in this fast paced, multi-dance style production. In just over one hour, you will follow Clara on her magical journey to the Land of the Sweets with her enchanted Nutcracker Prince. Each performance is followed by a visit from Santa Claus and a chance to meet the performers. 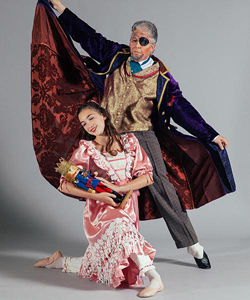 Impressions of the Nutcracker is truly a holiday treat for the whole family!